Baja Burrito Kitchen was once a local chain of fast food Mexican restaurants with several locations around Central Florida. I always enjoyed the food at the various Baja Kitchens, but for whatever reasons, all but one of the restaurants closed. The only remaining Baja Kitchen is in a shopping center on Colonial Drive in Orlando. 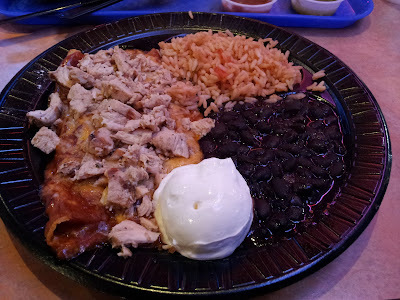 It had been years since I had last dined at a Baja Kitchen, but I recently stopped in for dinner. The meal started with some tortilla chips and various salsas. 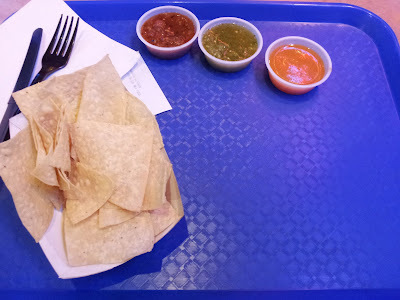 Their salsa bar was always a highlight of a visit to Baja Kitchen. Their fire roasted chipotle, salsa verde, and habanero salsa were my favorites. I had the Baja Enchiladas for my main course. This came with three cheese filled tortillas, topped with a red enchilada sauce, cheese, and chicken. Black beans, rice, and sour cream were served on the side. There was probably far too much cheese on my plate than I should have eaten in once sitting, but the meal did give me a warm, fuzzy feeling from food memories associated with this dish. This plate of Baja Enchiladas brought back memories attached to when I used to frequent the Baja Kitchens that were once located closer to where I live. It was definitely strange having many memories of various meals with various people from years ago come rushing back, just because I had a particular version of a particular food. I had dinner while in Saint Petersburg at an Italian restaurant called BellaBrava. Based on the location, right by the water in an area that seemed like everything would be expensive, I was surprised how affordable everything was here. The majority of the menu items were under $10 and there were some interesting takes on Italian foods. Some of the pizzas were especially interesting to me. I had the Asparagus & Crispy Prosciutto Pizza. This pizza was topped with asparagus, crispy prosciutto, smoked mozzarella, and a sunny side up egg. They served half the pie alongside a side Caesar salad. This was my first time trying egg on a pizza. Egg always seemed like a very strange pizza topping to me, but much like pineapple on pizza, I enjoyed it once I tried it. The runny egg yolk dripped down and got absorbed in the airy pizza crust, adding a whole new element to the pie. My only real complaint about this pizza was with the asparagus. There weren't any actual asparagus heads topping the pizza. Instead, there were only asparagus stems, but they were still tender and edible so it really isn't a big deal. I was pleased with my food here. The pizza was tasty and the toppings weren't what everyone else serves. Prices were affordable and the location was also very nice. I'd return. I ate dinner at a restaurant called Palm Tree Grille in Downtown Mount Dora. Although the name wouldn't imply this, the restaurant had a menu featuring mostly Italian food. There were also some typical sandwiches (burgers, turkey, etc) that didn't seem very Italian on the menu. Since the menu was mostly Italian, I figured ordering some sort of pasta dish would be a wise choice. I picked the Farfalle de Pesto, which was bowtie pasta tossed with a pesto sauce made from roasted ground garlic, fresh basil, served in an alfredo sauce with Romano cheese. This wasn't the typical basil pesto that I would expect from something with pesto in the name. Instead, the sauce had a much stronger alfredo flavor as opposed to the basil. It wasn't bad, just different. The portion was very large for the price and was also served with a side salad. I'd return to Palm Tree Grille again. I don't know if I'd order the same farfalle de pesto again, just because it was a lot of the same. Regardless, this was an unexpected restaurant find in Mount Dora! I recently met with Traveler Foodie to try a new Vietnamese restaurant on Colonial Drive called Ha Long Bistro. Although there has been Vietnamese restaurants in this location for as long as I can remember, the restaurant has recently gotten new owners and has undergone a name change. When we first arrived, we tried the Goi cuon (summer rolls) and the Cha gio (crispy spring rolls). Goi ngo sen tom thit was the next dish I tried. This was a salad consisting of lotus root with shrimp and pork. The lotus was pickled with daikon and carrots, making all the vegetables somewhat soft with a nice pickled flavor. The salad was served with rice crackers on the side. The Bo xao luc lac was stir-fried cubed steak in Ha Long's house special wine sauce. The beef was nice and tender and had nice flavor. The Mì xào giòn (hoặc mềm) thập cẩm consisted of pan fried crispy egg noddles topped with a combination of seafood, beef, and vegetables. This particular dish confused me. Some of the crispy noodles stayed crispy. Others that touched the sauce quickly became soggy. Were the noodles supposed to stay crispy? Were we supposed to mix the noodles with the rest of the dish so they all became soggy? I suppose I don't have enough experience with crispy noodle dishes to really criticize, but nothing was exceptional about the meat (seemed overcooked) and vegetables topping the noodles either. Phở áp chảo hải sản was described as flat rice noodle with seafood combination. This particular menu description left a lot to be desired. What I would have imagined from reading about this dish was very different from what was served, which in this case was a good thing. The actual dish was much better! The flat rice noodles turned out to be noodles pan fried into a cake topped with egg. This noodle/egg cake was then topped with a mixture of seafood and vegetables. The seafood was tender, the sauce had very nice flavor, and the noodle/egg cakes were completely new to me. I liked! The Hủ tiếu Nam Vang thập cẩm was a large bowl of soup. The tasty chicken broth was filled with shrimp, thinly sliced pork, crab meat, egg noodles, and assorted vegetables and herbs. A side plate of bean sprouts, cilantro, and jalapenos was served on the side. This soup didn't seem to be anything too different from similar soups that I've had at other nearby restaurants, but that isn't necessary a bad thing. It was tasty and had everything that I would expect from a soup like this. For a soup that was very different from what I've had at Vietnamese restaurants in the past, we came to the Canh chua cá hoặc tôm. This was a family style sour soup with shrimp. The most apparent ingredient floating in the soup were the quartered tomatoes. Pineapple was also present, but the two ingredients that were very different were elephant ear and rice paddy herb. The elephant ear was a light green sliced vegetable that had the appearance of cucumber and the texture that could somewhat be described as a spongy version of celery. Elephant ear grows in Florida and after living in the state for most of my life, I had no idea that the plants were edible. The rice paddy herb was another new food to me. The plant had an interesting, slightly tart flavor. With all the ingredients put together, I thought this soup was delicious. It had a combination of flavors that were very unique and slightly hard to pinpoint. There was a sour flavor, but I liked it. The pineapple balanced out the sour and rice was served alongside the soup in case the sour flavor was too much. Overall, this was my favorite dish that I tried at Ha Long, not only because of its unique flavors but also because of the education I got on some new types of edible plants! Cá kho tộ was the Vietnamese braised fish in a clay pot. Technically, the pot was actually cast iron, but lets forget the minor detail. This dish consisted of tender pieces of tilapia in a very tasty sauce. The Vietnamese Coffee came in a large, ice-filled glass. As someone who rarely drinks coffee, this tasted like coffee with milk to me. I did enjoy the Jelly Drink. It consisted of shaved ice, coconut milk, strips of green jelly, and kidney beans. Mixed together, this was like a really good version of a snow cone with more interesting ingredients! I did enjoy my meal at Ha Long Bistro. Most of the food was good and I would gladly return. Although, coming from the perspective of an American who's experience with Vietnamese food comes mostly from the restaurants in the neighborhood surrounding Ha Long Bistro, I didn't notice all too much that separated them from the rest of the pack. We did try some unique foods that were new to me, but I wonder how many other restaurants nearby serve similar dishes that have gone under my radar until now? It isn't necessarily a bad thing that Ha Long Bistro is similar to their neighbors, but as the new restaurant on the block, I wish them the best of luck with all of the competition in the area. Triple Eight Cafe is the third consecutive Chinese restaurant that has filled this particular location. First there was Wonderful Chinese, followed by Asian Express, and now there's Triple Eight Cafe. What sets Triple Eight apart is that although the menu is mostly Chinese, they also have a section of Italian food and sandwiches. Triple Eight is also a full service restaurant as opposed to it's predecessors who were fast food. 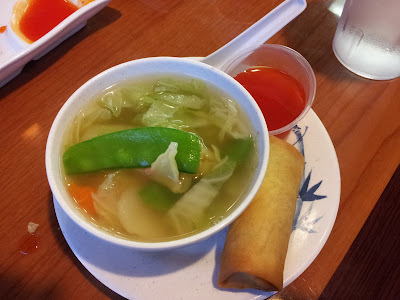 On my first visit to the restaurant, I had a combination dinner that started with a bowl of wonton soup and egg roll. The soup's broth was a bit plain tasting, but I did enjoy all the extra vegetables that don't normally come in wonton soup. There was cabbage, carrots, snow peas, water chestnuts, and large pieces of sliced pork. It definitely made the wonton soup more interesting than most. For the main course, I had the chicken with black bean sauce. 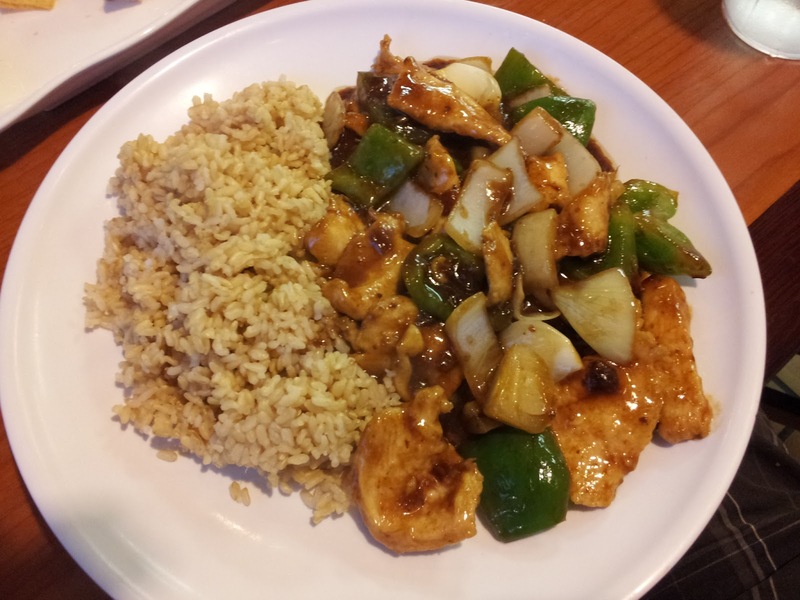 The large portion of chicken was cooked with green peppers and onions alongside brown rice. I have a pretty high salt tolerance, but I found the black bean sauce to be overly salty. The chicken definitely had to be mixed with the rice to take away some of the saltiness. While on Long Island, I had a bagel for breakfast from a restaurant called Bagel Doctor West. I suppose there is or was other Bagel Doctors in the area if they needed to add West to the end of the name. The restaurant was in a small strip mall and was typical of many of the other bagel places in the area. I had an everything bagel with smoked salmon cream cheese. The bagel was large and tasty, although it was slightly lacking in the seed department. I always find it interesting how different places do smoked salmon cream cheese. Sometimes it's the normal color of cream cheese with bits of lox mixed in, while other times it's blended resulting in a pink cream cheese that looks like it should be some sort of dessert flavor. Bagel Doctor West did the pink cream cheese. I personally prefer the first way of doing salmon cream cheese, but I still enjoyed this bagel regardless. Mister Softee is an ice cream truck franchise that seems to be very prevalent in the New York/New Jersey area. These trucks are found all over the place, whether it be in a city park, street corner, or doing the traditional ice cream truck thing by driving around residential neighborhoods. Unlike many of the ice cream trucks that are found down south, Mister Softee serves soft serve ice cream rather than only pre-packaged stuff. On my various visits up north, somehow I always find myself making a purchase from a Mister Softee truck. There's really nothing exceptional about the ice cream, but I enjoy the novelty of ice cream trucks. 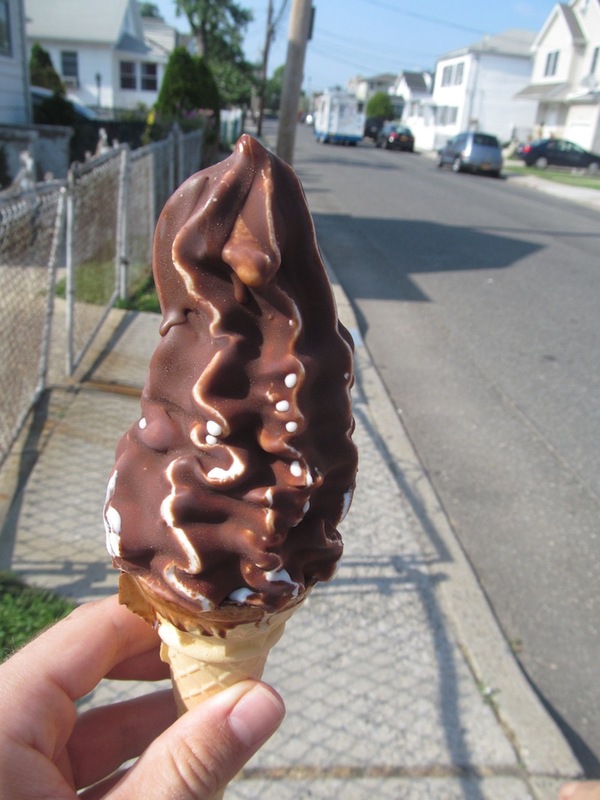 Here's a vanilla cone dipped in chocolate from a Mister Softee that I waved down on Long Island. Mister Softee trucks make it to the middle of the East River too. I found this truck parked on Governor's Island. I noticed the Mister Softee trucks parked in New York City parks have much higher prices than the trucks that drive around outside the city. Mister Softee recently appeared in Orlando for a while. This Mister Softee truck was often found at the local food truck events and was occasionally spotted driving around neighborhoods. I'm not entirely sure if this truck is still around, but it has been a while since I've seen the Orlando Mister Softee Truck. One thing that bothered me about the Orlando Mister Softee was that the people running it said it was impossible to dip a cone in both sauce (chocolate or cherry) and nuts. The Mister Softee trucks up north all do it, so I don't see while it would be impossible in Florida. Here's a cherry dipped vanilla cone from the Orlando truck when they were at Lake Lily in Maitland. I was in New York. I had just rode thirteen miles on a unicycle from the Brooklyn Bridge to Coney Island. The end of this epic ride was in front of the original Nathan's Famous hot dogs. It was time to eat and a hot dog seemed like an appropriate food. The inside of Nathan's was very busy with lines stretching out of the building. I got the feeling that most people in here were tourists, just like me, coming to get their taste of a famous Coney Island food. I ordered a hot dog with sauerkraut. It was exactly as I expected, just like what is served at the countless other Nathan's locations around the country. It was a hot dog, nothing more. The sauerkraut did dress it up a bit, but in the end it was still a pretty standard hot dog. Another night in New York and I found myself looking for dinner again. This took me to the Little India section of the East Village where I ate at a restaurant called Taj. They had musicians providing entertainment with sitar and drums near the entrance of the restaurant. Taj offered a six course dinner for under $10, so that's what I went with. Course number one was a bowl of red lentil soup. The bright orange color of red lentils make soup look more enticing compared to their brown counterparts. Course number two was a samosa appetizer. The vegetarian samosa contained potatoes and vegetables, wrapped up in a pastry-like shell. The third, fourth, and fifth courses were all served simultaneously. These included a basket of naan and a big plate of rice for the table to share. The main course also came out at this point. This was the chicken tikka masala in my case. Cubes of chicken were served in an orange, yogurt based sauce and was very tasty. The vegetables that were also supposed to be in the dish were unfortunately nowhere to be found. Course number six was rice pudding for dessert. I honestly wasn't counting how many courses we were served for the entire meal, so it was an unexpected nice surprise when dessert was served. It was an even nicer surprise when a second serving of rice pudding was brought to the table after we finished the first! I enjoyed my meal at Taj. I really like these multi-course meals that all of the Indian restaurants in this neighborhood seem to all serve. They end up being a really good deal for the price, and I would much rather eat Indian food like this as opposed to the much more common Indian buffets. I was wandering around Manhattan near Times Square late one evening when it was decided that everyone was hungry and food was required. Without venturing too close to the overpriced chains that dwell in Times Square, we decided to try a deli/supermarket/convenience store that was open called Oliviero Cafe. They had a much bigger selection of foods than I was expecting. There was a salad bar. There was a sandwich counter. They had sushi and a pasta bar. It seemed like they were in over their heads in trying to do everything, but it seemed to be working. I ordered from the Korean section of the menu and had the vegetarian bibimbop. Not being well rounded in my Korean foods, I wasn't exactly sure what I was getting but it was described as a rice bowl. The bibimbop turned out to be a large bowl of steamed rice topped with a fried egg, mushrooms, onions, squash, carrots, and broccoli in what tasted like a teriyaki-like sauce. Random post about a Greek diner in Queens called Triple Crown Diner. The diner is located relatively close to the Belmont Racetrack, hence the Triple Crown name. Like most of the other 24-hour diners like this in the area, it's superior to one of the chain 24-hour restaurants for late night food.